I would love for it to be said of me that I was "like Anna," (Luke 2:36-38) someone who focused on nothing and nobody except Jesus. In every prophetic word, long ones or short ones; every vision; every dream; every inspired prayer, I want to be declaring the testimony of Jesus (see Rev. 19:10). I want to be like John the Beloved, leaning my head on His chest, and then telling others about Him. Do you love Him? If you love Him, your heart will overflow with words about Him. In loving Him, none of us will be exactly like Anna, because the overflow will take different forms. The message of love will come in different wrappings and it will be presented in different styles. Marketplace manners are a little different from prophetic conferences. Culture differs from place to place. But the simple truth is that all adventures in the prophetic realm must be rooted in the same soil—expressing the love of God. When you stir up the gift and release it, you are doing what the apostle Paul taught: "Follow after love and desire spiritual gifts, but especially that you may prophesy" (1 Cor. 14:1). Prophecy in its purest form is supposed to be about loving people with Jesus' love. God has put into you a tiny measure of His massive heart of love and His Spirit decides to open up a little spigot. Even a tiny measure of His love overwhelms us, whether it comes with signs and wonders or in the midst of a quiet, calm, little conversation. For each of us, the various expressions of the prophetic gift differ, depending upon our personalities and what God has called us to. Each of us is a unique creature. God never uses a cookie cutter. The varieties of giftings and ministries that we read about in the New Testament become further varied as they are expressed through such a wide variety of individuals. "There are various gifts, but the same Spirit. There are differences of administrations, but the same Lord. There are various operations, but it is the same God who operates all of them in all people" (1 Cor. 12:4-6). Mighty streams of prayer and praise, combined with the prophetic, are encouraging the manifest presence of God. The worship movement is maturing and bringing us into higher realms of glory. 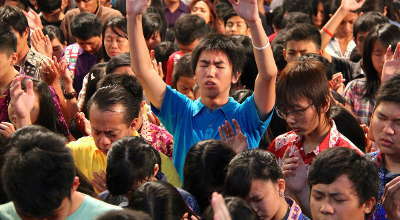 Miracle manifestations are proliferating, not only in Third World countries, but also in the West. Marketplace ministry, never heard of until recently, is increasing. Guided by the Holy Spirit, Christians exercise their prophetic gifts in their places of secular employment, bringing much-needed wisdom and prophetic intercession into new situations. The matrix of relationships. The gifts do not thrive in isolation; they require a healthy relational community of faith. Missions outreach. In spite of world recession and the well-established indigenous church, both long-term and short-term missions continue to be launched, based in many countries, including new places. Middle East emphasis: God is doing something in Israel and in the regions surrounding Israel as people bring the gospel of the kingdom to the Jew first and then to the Gentile (see Rom. 1:16). Mercy ministries. My late wife, Michal Ann Goll, responded to a call for this one. She ministered in Mozambique, Thailand, Burma, among the First Nations and wherever else she was able to release the message that Compassion Acts. Media mania—another way of saying that every new means of communication, public and private, is being used by people of the kingdom. The Holy Spirit is helping the worldwide church to achieve a remarkable level of unity and energy in "doing the stuff." Whether we face more storms or times of fulfillment, it is time seize the moment, listening to the Spirit for direction. The body of Christ is accepting an incredible opportunity to shift and move into kingdom alignment. Here He is, living inside each person who names Him as Lord, with a goal of transforming us into His image day by day. As we come into union with the Creator of the universe, who knows us better than we will ever know ourselves, we grow in our experience of new creation realities. Christ in us is the hope of glory (see Col. 1:27). The Spirit who dwells inside us is also the spirit of prophecy, and as you will remember, the spirit of prophecy is the testimony of Jesus (see Rev. 19:10). As the spirit of prophecy draws you continually to the Lord of love, you will know God better and better. There is our cure for weak character—and our primary prophetic message. What an adventure this life with Him is turning out to be! Yes, there will be a generation that walks in the double: fullness of fruit (character) and fullness of power (gifts of the Holy Spirit). And when we add the Spirit of Wisdom to that, oh, what an adventure that will truly be!